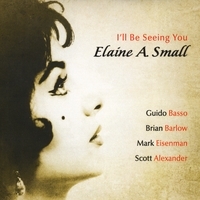 After a lengthy suspension of her succesful singing career Elaine is back, better than ever - this time with a mellow jazz-pop compilation supported by some of Canada's finest jazz musicians including award winning trumpeter Guido Basso . Elaine A. Small, singing under the name of Elaine Steele, fashioned a highly successful career in the late 1960's-'70s. To quote the Toronto Star, she gained recognition as "...one of the best supper club singers in Canada..." Elaine had followed her childhood dream to become a professional singer and eventually became a bona fide musical star, featured on many Canadian television and radio shows, appearing in all of the major supper clubs across Canada and the Northern USA. After suspending her singing career for family reasons, Elaine is excited to be performing again, this time with some of Canada's finest Jazz musicians: trumpeter Guido Basso, drummer Brian Barlow, pianist Mark Eisenman and bassist Scott Alexander. The songs on "I'll Be Seeing You," commemorate the resilient sounds and lyrics of the Great American Song Book. These tunes make up Elaine's verdant musical memories and are the driving force of her Award winning book, "Priests in the Attic," published in 2010--a candid memoir of high profile careers and the influence of those songs first heard in the crib, so emotionally moving they refuse to die. Singing again has been a real thrill for Elaine as it is truly her first love, and it shows. She sings with great clarity and fellow jazz musicians praise her ability to "'really swing." Blessed with a wide vocal range, Elaine brings to life time-honored songs in unique jazz arrangements by producer, Brian Barlow. ... the Album was recorded at Pinnacle Music Studios by Ken Harnden and sounds crisp and clean with a warmth to the sound. 'It Had To Be You,' ' How Deep is the Ocean' and the stirring tittle track. A medley of three songs is propelled by Scott Alexander's basslines, while Eisenman shimmers throughout. Basso is featured on 'Besame Mucho,' and a growling rendition of 'Come Rain or Come Shine'. Barlow is the quintessential drummer of his time, perfectly punctuating the musical lines and tastefully playing exactly what is needed to highlight the song. Elaine Small's voice sounds warm and genuine with hints of Ella Fitzgerald in her lower range. That is a compliment I do not throw around casually, because jn my mind, Ella was the ultimate vocalist. Perhaps the accumulated wisdom and experience of her years make her performances more grounded. There is a delightful poignancy to hearing her sing 'You Make Me Feel So Young'. This woman is very inspiring; I love Elaine's story here. I get a sense of great heart from Elaine in the video and I feel great after watching it and listening to her CD, I'll be Seeing You. Amazing! I have been listening to these songs all my life, great classics excellently done. The vocals and band are fantastic, this is an outstanding addition to anyone's collection ! Great C.D. featuring classic songs by an artist who knows how they should be presented. Elaine Small has arranged these classic songs so that you not only enjoy her talented vocals, but also great sounds from the musicians. This is a C.D. you can enjoy often. Great job!